The Itty Bitty Kitty Committee: A Beautiful Gift! My neighbor, Kate, has always been a big supporter of the IBKC. She always gives generously to our FUNdraiser, and often stops by with cat climbers and toys for our kittens. She loves casts and cares for many -- her own and the free-roamers in our neighborhood, too. Susan, her co-worker, shares a passion for cats as well, and has been very supportive of the IBKC, too. 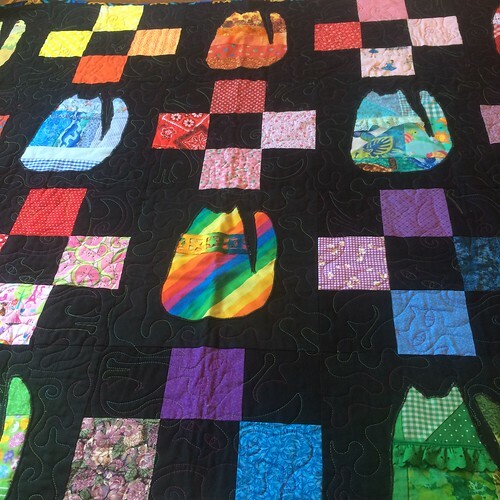 Together they created something very special for us -- an amazing cat-themed quilt for us to auction off for our fundraiser. Kate told me last summer that they were planning to do this, but I had no idea what to expect. I nearly teared up when Kate stopped over and unfolded this beauty for me. How special it is -- and how much time and love went into the making of this. What a generous thing to give. 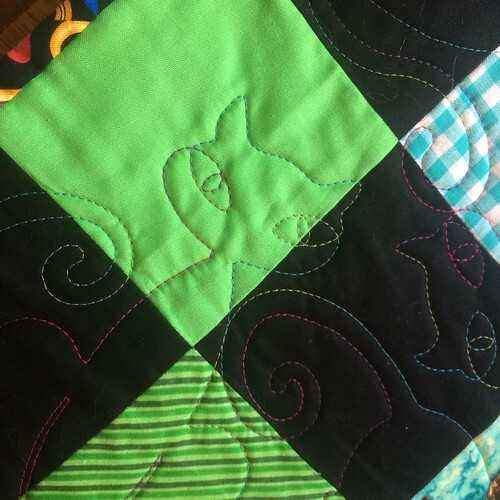 Tomorrow morning the auction will go live, I'll share more about the quilt, and we'll all have a chance to bid on this. Thank you so much, Kate and Susan, Your work is not only lovely, but so touching, too. We appreciate this generous gift so much!! Wow! That is so beautiful. I wish I had a squillion dollars to get in on this raffle, but I've hit my limit already (or Clem and Zeke did, but hey, it was my card). Gosh, that's so beautiful!!! What a work of love, given with love. That is beyond spectacular! Will she share the directions? That's worth a couple squees! What a gorgeous quilt! 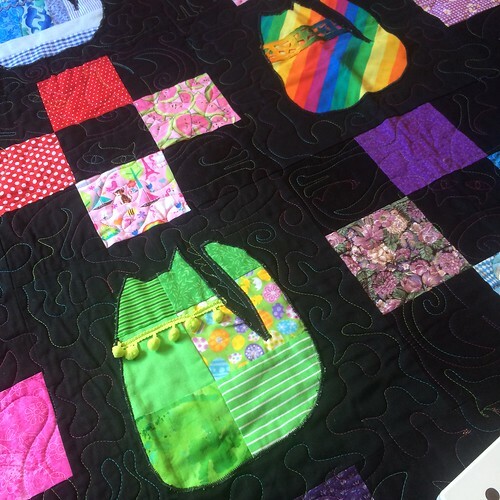 And the quilting itself is in the outline of kitties -- that takes the quilt from the realm of wonderful to the realm of totally fabulous! I know it will bring many, many squillions in for the fundraiser. Please thank these talented and generous ladies for us all! As a quilter I know how much LOVE and work goes into these! It's beautiful! Oh gosh! I wish I was wealthy!!! This is beautiful and I wish I had the money to bid to win, because I'd love to hang this on my wall. That is so clever! I love the stitching. What a sweet donation. Wow! It has love written all over it. What a beautiful creation and lovely gift. I'm in huge admiration of quilters.This one is so beautiful and appropriate. Good luck to all who bid! Surely this will bring in squillions! 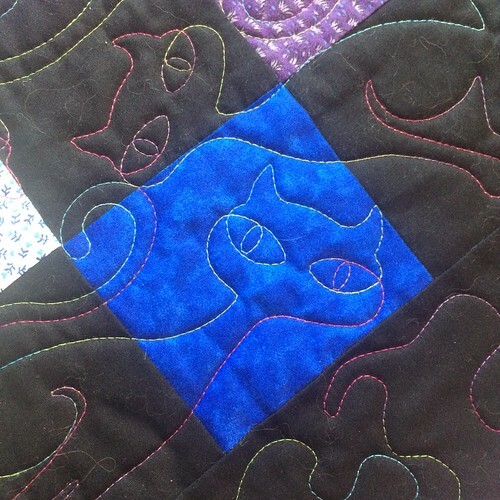 I have a quilting question: would those outlines of cats have been put in by hand, or by machine? That is just gorgeous. 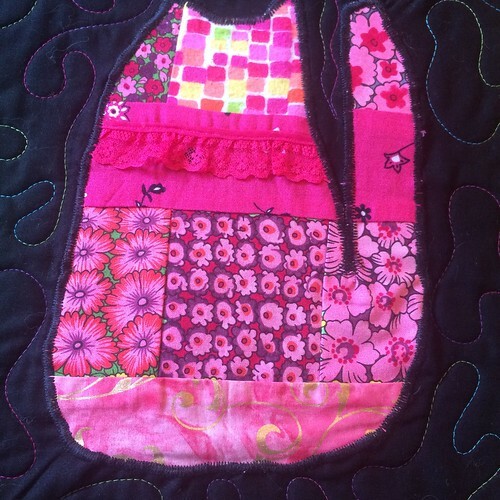 So beautiful and, as someone noted, the kitty quilting puts it over the top.